Over the last few years we've had more hill and gully rides than you can imagine. 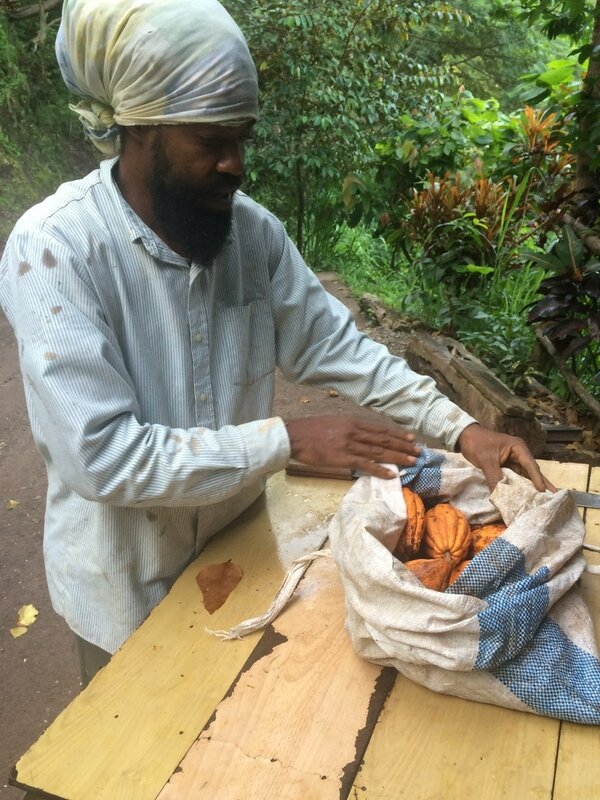 We've searched the island to find the wonderful variety in Jamaican Grade A cacao beans. We source from farmers direct both big and small to get really well fermented, high quality beans. With chocolate making what happens at harvest and afterwards is key. We're working with our partners in parishes across the island, from St Thomas in the East through to Hanover in the West. We then roast in a state of the art roaster that develops the fine flavours using hot air. The "Cookshop" as we call our factory slowly fills with the smell of chocolate brownies as the beans hit their sweet spot, a great way to start a day. The industry standard is that 1.5% of your chocolate will be husk, that just doesn’t sit well for us. We aim to get all the chocolatey nibs and none of the gritty outer bit. It really isn’t what you’re paying for and it doesn’t taste nice! It's actually the part of the process I don't like, I'd prefer to do it by hand but trust me, it's a killer on your fingers so we've got some cool repurposed coffee machines which do a much better job. This bit is our favourite, the one we love the most, slowly and I mean slowly, we add the ground beans. Then over the course of many, many hours our chocolate changes, it gets physically smoother and the tastes get richer, the bitterness changes to something that just feels luxurious. We specialise in 70% bars that are plain and packed with health benefitting antioxidants or have the added boost of super foods sourced right here in the Caribbean. We make chocolate, in a one/one way. In Jamaica there’s a saying; “One, one cocoa full basket” it sort of means that little by little we get the job done. For us that means making lovely chocolates, providing skills and training and building a better world for us here in Jamaica by taking the raw materials that we’re blessed with and do more, doing something to make our own future. We’re working with farmers and community groups to get the best beans we can. We're making links with like minded buyers abroad to improve the livelihoods of people here and build an industry. A rising tide floats all ships and by showing we can make exceptional chocolate here locally it gets more people involved, Farmers, chocolate makers, chocolatiers which means everyone starts paying better rates for the raw material.